Luxury dining and relaxation meet in the perfect combination with Lago by Julian Serrano, the highly acclaimed Italian small plates concept that debuted in April at Bellagio Resort & Casino, that will introduce lunch and brunch experiences to be enjoyed with unparalleled views of the iconic Fountains of Bellagio. James Beard Award-winning Chef Julian Serrano has re-conceptualized his celebrated recipes for a light and delicious approach to daytime dining. Guests will have the choice of enjoying a three-course prix-fixe menu for $28 or selecting dishes à la carte, making Lago the ideal place for a quick power lunch or leisurely experience. Chef Serrano’s creative specialties will include lighter portions of Lago’s popular small plates in addition to paninis, salads and entrees. 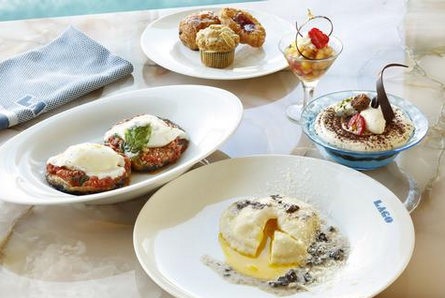 Lago brunch will invite guests to revel in an unforgettable three-course feast for $38 per person beginning Sunday, Aug. 30. The prix-fixe meal begins with a basket of freshly baked pastries for the table full of Zeppoles, Bombolones, Cinnamon Rolls and more. Visitors can then choose a dish from inventive antipasti including Raviolone, a pasta pocket filled with truffle ricotta and topped with an egg yolk and summer truffle butter sauce; Shredded Salmon Salad with apples, candied walnuts and pesto; and Duck and Polenta, braised pulled duck meat served with cheesy, soft polenta. The next course is filled with Italian twists on brunch staples such as Eggplant Parmesan Benedict, eggplant parmesan topped with a poached egg; Nonna’s Frittata made with baked eggs, fresh vegetables and mozzarella; and Pizzetta with Italian cured granciale, ricotta and egg yolk. Brunch-goers complete their meal with decadent dessert choices ranging from a classic Tiramisu to Panettone Pudding and Nutella Crespelle. Lago brunch will replace Jasmine’s Fountains Brunch, scheduled to offer its final dining experience Sunday, Aug. 30.